This start-up is reinventing transcription for publishers and journalists across the UK and US. Anyone that works in content and publishing will know that manual transcription is an often painful and arduous process. For instance, at Startups’ it can take hours of time and resource to transcribe a simple recording – and this is a problem shared by publications big and small, and the journalists that work for them, worldwide..
Trint has come up with a solution; offering what its founder, Jeff Kofman, refers to as ‘transcription relief’. Using artificial intelligence (AI), Trint is able to glue audio and video seamlessly to an automated transcript and makes it possible for the user to search recorded content by keywords, verify content by listening to just a portion of an audio or video file, and enables the user to edit a transcript in minutes. Launched in 2016 by former news correspondent Kofman, who knew the problems of manual transcription all too well, Trint is already available in 13 languages with several high-profile brands using Trint to amplify their content. Thomson Reuters, Vice Media, The New York Times, The Associated Press, ABC News and ESPN are all customers. 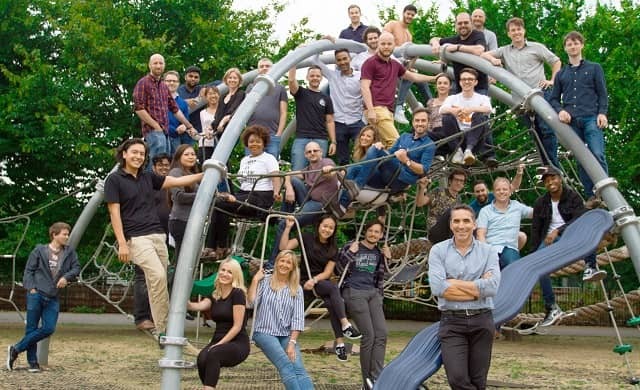 Kofman has built a team of 41 staff and is currently pursuing plans to “aggressively” scale in the US and Canada, having recently opened North American headquarters in Toronto. And he has the support of Google to help him with his expansion plans. In July 2018, Google chose Trint as one of only two businesses in the UK to receive funding from its €150m Digital News Innovation Fund. Describing Trint as “rocket-fuelling innovation”, Google provided €300,000 to support the company’s development and leverage multilingual translation AI. We’re astounded, but not surprised, by Trint’s explosive growth. Having already scaled its tool to customers across the UK and US in less than two years, Kofman and his team are considering markets in the Middle East and Asia for future expansion. New verticals and industries are also on the cards; Kofman tell us that he sees huge potential in deploying Trint in government, corporate communication, legal, media monitoring and marketing. For media inquiries, please contact marketing@trint.com.